The church building was constructed in 1906, with the sanctuary added in 1936. This article goes into a lot of details about the specifics of the church’s history, architecture, and the features of the inside. The service was led by a priest in green and white vestments, assisted by an altar server in red. A gentleman from the congregation in plain clothes gave the first two Bible readings, and a lady in choir dress sang the Gloria and the responsive psalm. A choir of about a dozen accompanied the hymns from the organ gallery, and a lady from the congregation helped the priest give out communion. The congregation numbered just over a hundred, with a roughly 2:1 female-male ratio. There was a wide age range, with several families and young people, and a good proportion (about a quarter to a third) of people from an ethnic minority. The congregation seemed friendly, with the people who joined me on the pew I chose welcoming me to the church, and a real sense of community was evident in the way both in which people greeted each other upon entering the church and talked to each other after the service. I attended the Sunday morning 11:15 am Mass. This followed the Pauline Mass or Ordinary Form structure, observed by the majority of Roman Catholic churches. The service started with the priest, the altar server, and the reader processing to the sanctuary to an opening hymn. After prayers of penitence and the Gloria, there were Bible readings: I Kings 3:5-12, Romans 8:28-30, parts of Psalm 119 (sung responsively), and Matthew 13:44-52. Unlike in other Roman Catholic churches I have been to, I did not notice any incense being burnt during the Gospel reading, although it was otherwise accompanied by the usual acclamations and read by the priest himself. The sermon followed the theme of what we hold to be valuable (the Kings reading being Solomon asking for wisdom above anything else, and the Gospel reading comparing the kingdom of heaven to a pearl of great price). The priest related the discovery of the Dead Sea Scrolls as an example of finding an archaeological treasure, and asked us to consider what we hold dearest to our hearts in our own lives. There was then a collection, during which a second hymn was sung. Thereafter followed communion, preceded by prayers (including the Lord’s Prayer) and the Creed. Most of the congregation took communion, although some stayed in their seats. After communion, the priest read out some notices, and blessed the congregation before processing to the entrance of the church with the altar server while a final hymn was sung. Immediately after the service ended, the organist played a piece on the organ, which many members of the congregation stayed behind to listen to, clapping at the end. Tea, coffee, biscuits and cakes were available in a church hall which had a door leading out into a garden for the children. I would just add that, having visited on Pentecost, the pillars were decorated with banners showing angels on a red and gold background, and also had bunting-like decoration made of flowers connecting them. Furthermore, the stained glass window at the back – depicting Christ glorified – is positioned such that the sun was shining through Jesus at the end of the service. I thought this was beautiful, and have included a photograph of it to the right. The service was conducted by a priest in red and gold vestments, the same colour scheme as that of the banners on the pillars. He was assisted by two others in white vestments with beige and red trimmings, who were either assistant priests or deacons; I couldn’t be sure, as I didn’t have a great view (more on that later). Several altar boys carried candles during the processions around the church, and the first two Bible readings were given by members of the congregation. Two ladies with quite wonderful singing voices led the responsive prayers and psalms. The congregation was far too large for me to accurately count, and must have numbered somewhere in the region of two hundred people. There was a wide range of ages and ethnicities, and it was not overwhelmingly balanced in favour of one gender or another. I attended the 11:30 mass, on Pentecost. Due to the size of the congregation, there was not much choice when it came to seats, and I unfortunately found a pillar blocking most of my view of the sanctuary. This, together with the fact that I’d sat next to a gentleman with some sort of disability who made loud noises throughout the service, meant that I unfortunately did not see or hear as much of the service as I’d ideally have liked to, and so this review may be lacking in some details. The service followed the Mass of Paul VI, the order of service ordinarily used in Roman Catholic churches, which has a basic structure of introductory prayers, Bible readings, communion, and concluding prayers. There were also some hymns sung during the service, the words of which were in hymn books which could be found at the back of the church. It being Pentecost, the Bible readings were focused very much on the Holy Spirit, and were given from Acts 2, 1 Corinthians 12, and John 16. As well as Pentecost, today was also the first time that several young members of the congregation were having communion. As today was their first communion, they joined the procession at the beginning; they also appeared to be dressed as brides and grooms. The sermon was on the importance of receiving communion in a pious and reverent manner. After communion, the service ended with notices and a final hymn. 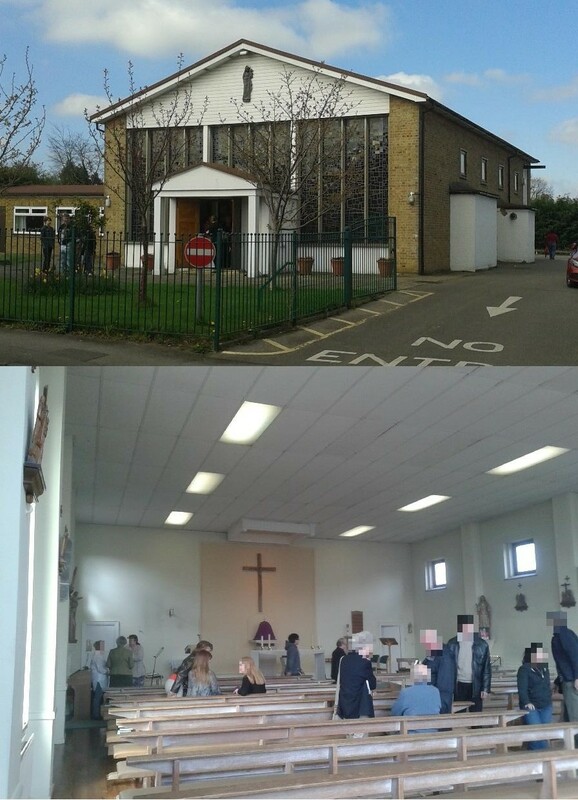 After the service, the members of the congregation either left, stayed in the church to pray, or went into the church hall next door, where – this being the first Roman Catholic church I’ve visited where this was the case – refreshments were available. A cake sale was also taking place. 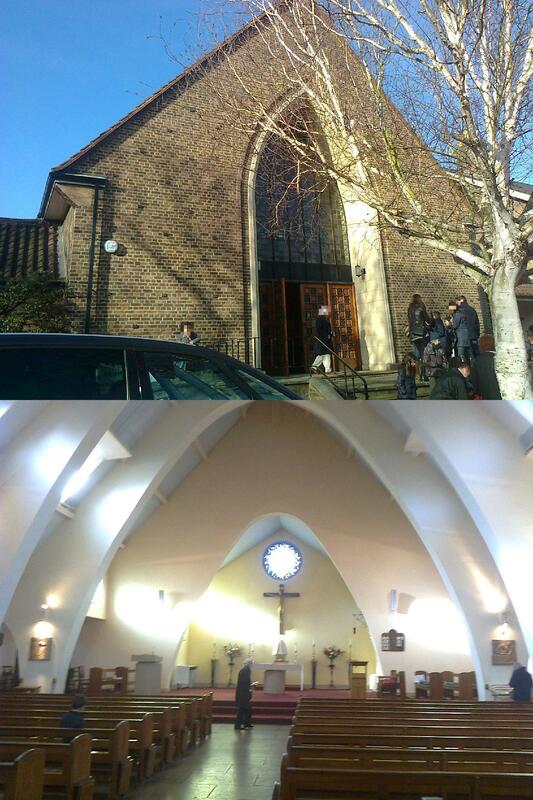 The church of St Osmund can trace its history back to a Roman Catholic mission at Barnes established in 1907. The mission acquired a chapel, which in 1953 began to be rebuilt into the current church building, designed by the architect Ronald Hardy and officially opened on 16 July 1955. 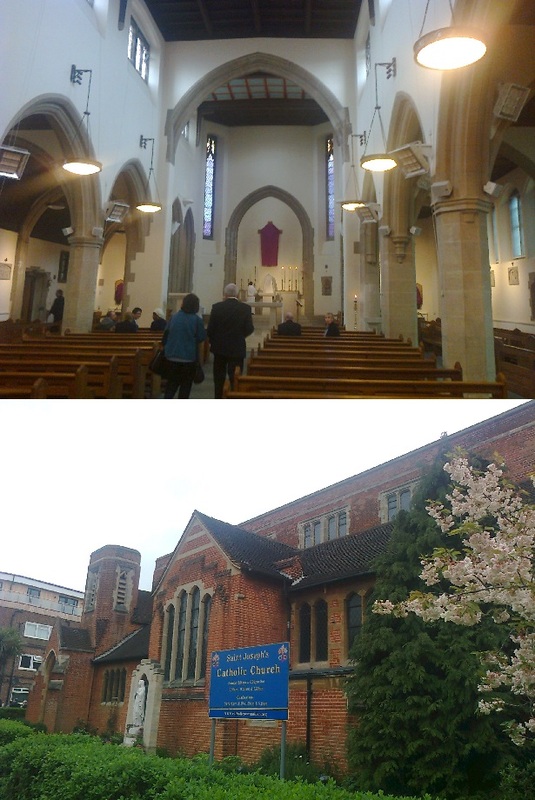 The church is affiliated with a nearby primary school, which may go some way towards explaining the large amount of young children present at the service I attended. The interior of the church has an interesting look to it, with the walls and ceiling being formed by near-triangular curved arches (see photograph). Stone Stations of the Cross are situated on each side of the arches, and on either side of the nave is a statue with votive candles placed underneath, one of the church’s patron saint Osmund of Salisbury, and another of a monk whose name I did not manage to see. A stone altar and pulpit are situated in the sanctuary area, as well as a wooden lectionary and small pews for the altar servers. A tabernacle for reserved communion is set behind the altar, above which is a large crucifix. Above this is a circular stained glass window, with a representation of the Holy Spirit in the form of a dove. Candles and flowers are also placed at the back of the sanctuary area, flanking the tabernacle. The service was taken by a priest in vestments of pale gold and bright red. He was assisted by altar servers; six girls, three boys, and one older gentleman. Some of the prayers and readings were taken by a lady from the congregation, and there was a small choir seated in a gallery behind the nave. I could not make an accurate count of the number of people in the congregation, but most of my attempts came to somewhere around 105. There was a roughly equal balance in gender, and several people of an ethnic minority. There were about 25 young children in the congregation. Although I am well aware of Luke 18:16, I could not help thinking that it may have been beneficial for them to have some sort of junior church or Sunday school, or at least a designated area for them at the back, as most of them spent the service somewhat noisily playing with toys whilst seated amongst the congregation, sometimes to the point where it was clear that the priest would not have had to speak so loudly had they been quieter. The service was very similar in structure to those I attended at the other Roman Catholic churches I have visited, following the Pauline Mass order of service. The readings were Isaiah 55:1-11, 1 John 5:1-9, and Mark 1:7-11. The service had the theme of baptism and renewal, with the sermon focused on this topic. After the sermon, the congregation was invited to reaffirm their baptismal promises, with the priest reciting parts of the Apostle’s Creed in question form (“Do you believe in…?”) and the congregation responding with “I do” to each part. There was then an induction of four of the altar servers into a Guild of Saint Stephen, which after looking into I have found is a confraternity for Roman Catholic altar servers which was founded in 1904. The four altar servers being inducted into this organisation were blessed by the priest and awarded medals after making promises to serve the church. Communion then took place, with members of the congregation going up to the front to receive it both from the priest and from a lady from the congregation. After a closing hymn and blessing, the service ended. It lasted an hour and five minutes. Four hymns were sung during the service, but very few members of the congregation seemed to put much effort into them. Looking around, I estimated that only about one in three people were singing along to them, many not even looking at the hymn books – indeed, were it not for the choir, I doubt the hymns would have even been audible. Several people actually left the service once the closing hymn had started. The priest stood by the main entrance after the service, saying goodbye to the members of the congregation as they left. A coffee morning was held in the church hall, which was downstairs but accessible via stairlift, although the way in which I was told this was taking place strongly implied that refreshments are not (as has been the case in the other Roman Catholic churches I have so far visited) served every week. The church was founded as a missionary “Mass Centre” in 1905, being expanded into today’s church between 1921 and 1931. Previously dedicated to St. Egbert of Northumbria, the dedication was changed to St. Joseph (husband of Mary) in 1923. St. Joseph’s was raised to the rank of parish in 1949, and was officially consecrated as a church proper on 13 September 1951. While it would be unfair to call the interior “plain”, it is not as richly decorated as the other Roman Catholic churches that I have so far visited. There are some statues, but they were all covered in purple drapes for Lent – even the crucifix behind the altar at the front was covered in one. The windows aren’t very large, with most of the light coming from electric lamps; this was used to great effect by having the lights brighten during the service and decrease in brightness afterwards, with the church bathed in light when the service was taking place and somewhat dim when it wasn’t. An altar stands at the front with four candles on it and with a simple pulpit to the left of it. Behind the altar is a tabernacle flanked by six candles. The service was led by a priest in resplendent purple and gold vestments over a white cassock. He was accompanied by two altar-boys and a deacon, who all had white vestments. A lady from the congregation came up to the pulpit to take some of the readings and prayers, and a choir of about 11 people was in a balcony at the back of the church. The congregation was too large for me to accurately count, but probably numbered around 100-110. I noticed a reasonably large proportion of ethnic minorities and younger people, as well as a somewhat equal balance between genders. The service was very similar in structure to those I attended at the other Roman Catholic churches I have visited, following what I believe was the Pauline Mass order of service. The service started with the priest, deacon and altar-boys processing up the main aisle to the altar with a crucifix on a pole (even this had a Lenten purple drape on it!) during which the choir sung a hymn. After prayers of penitence, there came the Old Testament reading, Ezekiel 37:12-14, followed by part of Psalm 129 sung by the choir, and then a reading of Romans 8:8-11. The Gospel reading came next, preceded by an anthem, John 11:1-45 on the raising of Lazarus. After the readings came the sermon. This was related to the readings, being on the subject of raising to life, and was also used to encourage the congregation to go to confession more often. The sermon was followed by the Nicene Creed sung in Latin, after which prayers were said, both for some people preparing to be baptised into the church (who went up to the front while prayers were being said for them) and general prayers of intercession. A collection was then taken while the choir sung a hymn (which was unfortunately interrupted several times by bursts of static from the sound system) and the elements for communion were taken up to the altar, at the end of which one of the altar boys censed the congregation. After some more prayers, some of which (including the Lord’s Prayer) were in Latin, there came the sharing of the peace and a hymn by the choir in Latin. The choir then came down from the balcony that they had been in and sung another Latin hymn, after which they were the first to go up to communion, followed by most of the rest of the congregation. After communion had been taken, there were prayers, followed by notices and a dismissal blessing. The service lasted roughly an hour and fifteen minutes. Immediately after the service had ended, the priest, deacon and altar-boys processed with the veiled crucifix back to the church door, where the priest said goodbye to those leaving. No refreshments were available, although according to the church website they would have been there for the end of the earlier service (there being two on Sunday mornings).